It is that time of the year againthe days are getting shorter, the weather is definitely colder, and we have had snow on the ground. Inside the engine house, the shop crew is preparing steam locomotive 93 for some very special annual trips. What trips? Why, they are the most special trips of the year. Beginning the Friday after Thanksgiving, the Nevada Northern Railway Museums offers a very special train, the Polar Express! Join us for a magical trip to the North Pole to visit Santa Claus. At the front of the train, steam locomotive 93 will be hissing gently. The engineer will be oiling round and the fireman will be throwing coal into the firebox. The passenger cars Ely and Nevada will be decorated and ready for passengers. Then, just before departure time, the conductor will yell, "All Aboard to the North Pole!" Passengers will start loading. Once everyone is loaded, the conductor will close-up the train and signal the engineer that it is time to depart. Up front, the engineer gives three sharp blasts of the whistle while the fireman starts ringing the bell. Then the engineer pulls out the throttlefor a moment nothing happens. Then slowly, the wheels start turningthere is a cloud of hissing steam and then there is a mighty CHUFF! Slowly the train begins to pick up speed. The chuffs come quicker, the fireman is shoveling more coal into the roaring firebox, and it is off to the North Pole. Its snowing at East Ely and the Polar Express is ready to head up the track for another trip to the North Pole. Based on the popular children's book, The Polar Express, this is a story of a young boy and his sister who learn from their friends that there is no Santa Claus. On Christmas Eve, however, the boy hears a distant whistle and sees a locomotive pull into his front yard. He boards it and is on a journey northward; the destination is the North Pole. After he and the other children disembark, they learn that it is nearly time for Santa to begin his annual Christmas Eve journey. Before he departs, Santa will select one of the children to receive the first gift of Christmas, which can be anything that they wish. The young boy is selected, and after much thought, he chooses a bell from the harness of Santa's reindeer. We invite everyone to experience a real life Polar Express. We will fire up steam locomotive 93, hook up to the passenger cars Ely and Nevada, and journey northward on the Nevada Northern Railway Polar Express to the North Pole to see Santa Claus. On our way to the North Pole, the engineer will be watching the track ahead and operating a ninety-seven year old steam locomotive. 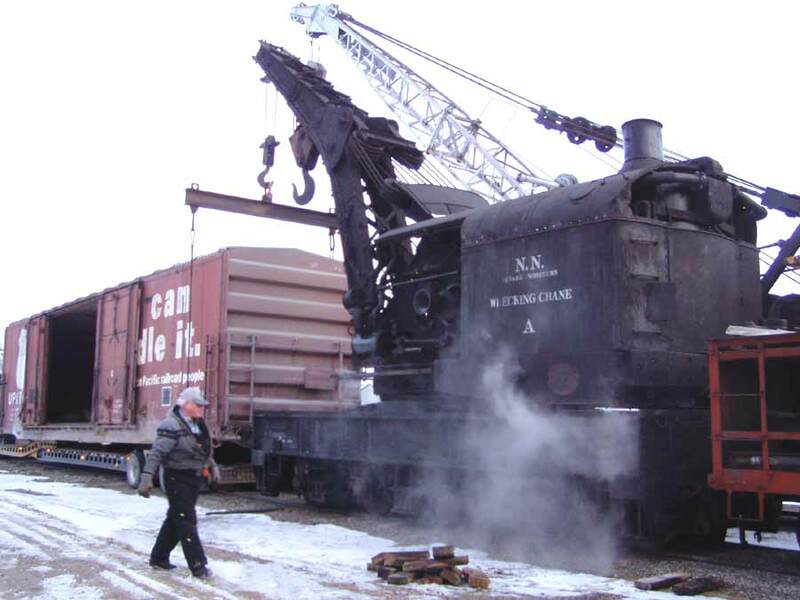 The fireman will shovel in two thousand pounds of coal into the firebox for one trip to the North Pole. Steam locomotive 93 will be putting on quite the show as the train heads north. Inside, train crewmembers will serve hot chocolate and cookies to all of our passengers. During the trip to the North Pole, we will read the story of The Polar Express. Upon our arrival at the North Pole, Santa will board the train and greet all of the passengers. Santa and his elves will present a silver bell to all of the passengers. After Santa gets off the train, we will head back to Ely. During the trip back everyone is invited to sing Christmas carols. So dress warmly and join us for our annual trek to the North Pole.